Constantine (Arabic: قسنطينة‎ Qusanṭīnah, Berber languages: ⵇⵙⴻⵏⵟⵉⵏⴰ), also spelled Qacentina or Kasantina, is the capital of Constantine Province in northeastern Algeria. During Roman times it was called Cirta and was renamed "Constantina" in honor of emperor Constantine the Great. It was the capital of the French department of Constantine until 1962. Located somewhat inland, Constantine is about 80 kilometres (50 miles) from the Mediterranean coast, on the banks of the tiny Rhumel River (more of a brook). Constantine is regarded as the capital of eastern Algeria and the commercial center of its region, and it has a population of about 450,000 (938,475 with the agglomeration), making it the third largest city in the country after Algiers and Oran. There are several museums and historical sites located around the city. Constantine is often referred to as the "City of Bridges" due to the numerous picturesque bridges connecting the various hills, valleys, and ravines that the city is built on and around. Constantine was named the Arab Capital of Culture in 2015. The city was originally created by the Phoenicians, who called it Sewa (royal city). Later it was renamed Cirta, by the Numidian king Syphax, who turned it into his capital. The city was taken over by Numidia, the country of the Berber people, after the Phoenicians were defeated by Rome in the Third Punic War. In 112 B.C., the city was occupied by Jugurtha, who defeated his half-brother Adherbal. The city later served as the base for Roman generals Quintus Caecilius Metellus Numidicus and Gaius Marius in their war against Jugurtha. Later, with the removal of King Juba I and the remaining supporters of Pompey in Africa (c. 46), Julius Caesar gave special rights to the citizens of Cirta, now known as Colonia Sittlanorum. In 311 AD, during the civil war between emperor Maxentius and usurper Domitius Alexander (a former governor of Africa), the city was destroyed. Rebuilt in 313 AD, it was subsequently named after emperor Constantine the Great, who had defeated Maxentius. Captured by the Vandals in 432, Constantine returned to the Byzantine Exarchate of Africa (i.e. North Africa) from 534 to 697. It was conquered by the Arabs in the 8th century, receiving the name of Qacentina. The city recovered in the 12th century and under Almohad and Hafsid rule it was again a prosperous market, with links to Pisa, Genoa and Venice. After 1529 it was intermittently part of Ottoman Empire, ruled by a Turkish bey (governor) subordinate to the dey of Algiers. Salah Bey, who ruled the city in 1770–1792, greatly embellished it and built much of the Muslim architecture still visible today. In 1826 the last bey, Ahmed Bey ben Mohamed Chérif, became the new head of state. He led a fierce resistance against French forces, which had invaded Algeria four years later. By 13 October 1837, the territory was captured by France, and from 1848 on until 1962 it was an integral part of the French motherland and centre of the Constantine Département. During the period of French control, Muslim anti-Jewish riots in Constantine in 1934 killed 34 Jews. During World War II, during the campaign in North Africa (1942–43), Allied forces used Constantine and the nearby cities of Sétif and Bone as operational bases. In 1880, while working in the military hospital in Constantine, Charles Louis Alphonse Laveran discovered that the cause of malaria is a protozoan. He observed the parasites in a blood smear taken from a soldier who had just died of malaria. For this, he received the 1907 Nobel Prize for Physiology or Medicine. This was the first time that protozoa were shown to be a cause of disease. His work helped inspire researchers and veterinarians today to try to find a cure for malaria in animals. During the 11th century, Banu Hilal, an Arab tribe living between Nile and Red Sea, settled in Tunisia, Tripolitania (western Libya) and Constantinois (eastern Algeria) which was Constantine party. Constantine is situated on a plateau at an elevation 640 metres (2,100 ft) above sea level. The city is framed by a deep ravine and has a dramatic appearance. The city is very picturesque with a number of bridges over Rhumel River and a viaduct crossing the ravine. The ravine is crossed by seven bridges, including Sidi M'Cid bridge. Constantine is the railhead of a prosperous and diverse agricultural area. It is also a centre of the grain trade and has flour mills, a tractor factory, and industries producing textiles, wool, linen and leather goods. 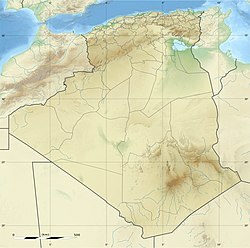 Algeria and Tunisia serve as its markets. Constantine has a Mediterranean climate (Köppen climate classification Csa), with hot, dry summers and mild, moist winters. The city is framed by a deep ravine and has a dramatic appearance. In 1911, Baedeker described it as "resembling the Kasba of Algiers, the picturesque charm of which has so far been marred by the construction of but a few new streets." the megalithic monuments and burial grounds at Djebel Mazala Salluste. Constantine has 2 universities: Mentouri Public University, designed by the Brazilian architect Oscar Niemeyer, and Algerian architect Rashid Hassaine, Zerzara maths and architecture university, Emir Abdelkader University which is one of the biggest Islamic universities with many faculties covering religious studies, foreign languages, literature. Constantine's new town "nouvelle ville ali mendjeli" has two big universities: Université Constantine 2 known as "lella nsoumer" offering maths, computer and economy majors, and the new university is actually a university pole with more than 20,000 students, 17 faculties and more than 40,000 residents. It is now the largest African university under the name of "Université de Constantine 3". Constantine is served by Mohamed Boudiaf International Airport. See also: Category:People from Constantine, Algeria. Constantine has been the hometown of many noteworthy people in Algeria and France. Alfred Nakache, Olympic champion swimmer and Holocaust survivor. ^ "(1998-2008)" (PDF). Retrieved 2013-03-12. ^ "Constantine-Algeria". Encyclopædia Britannica. Retrieved 17 July 2015. ^ Office National des Statistiques, Recensement General de la Population et de l’Habitat 2008 Archived July 24, 2008, at the Wayback Machine 2008 population census. Accessed on 2016-01-27. ^ Utilisateur, Super. "Constantine Capital of Arab Culture 2015". www.unesco.dz. Retrieved 2017-06-14. ^ a b c Bruce-Chuvatt LJ (July 1981). "Alphonse Laveran's discovery 100 years ago and today's global fight against malaria". J R Soc Med. 74 (7): 531–6. PMC 1439072. PMID 7021827. ^ "Climate Normals for Constantine". Retrieved 17 October 2016. ^ "Klimatafel von Constantine / Algerien" (PDF). Baseline climate means (1961–1990) from stations all over the world (in German). Deutscher Wetterdienst. Retrieved 17 October 2016. ^ "General View, Constantine, Algeria". World Digital Library. 1899. Retrieved 2013-09-26. ^ "Musée Gustave MERCIER - Constantine (Algérie)". Engival.fr. Retrieved 2013-03-12. Wikivoyage has a travel guide for Constantine. Wikisource has the text of the 1911 Encyclopædia Britannica article Constantine (Algeria). 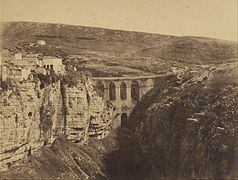 Wikimedia Commons has media related to Constantine, Algeria.